Most of us who are involved with recreational fishing know what a reel is and the basics of what it does. However, we have many types of fishing reels, used for different types of fishing or situations. You might be asking yourself, what difference does it make what reel I use? Well, it does make a difference, because each type fishing reel is designed with a specific use or experience in mind. After all, you wouldn’t go marlin fishing with a spincast reel or take an offshore reel to go catch panfish… well, hopefully not. Today we are going to take a look at some of the most popular and widely used types of fishing reels available to the angler, as well as what makes each the best tool for a particular type of angler or style of fishing. Remember the spincast reel? It was the first reel many of us started out fishing with as kids. As a whole, the spincast reel is known for being an inexpensive reel. It is also an easy reel to use, and a great reel to use for the first-timer just getting started, mainly because it requires a minimal investment. The spincast is commonly used by children and casual anglers. There is a push button release (…ah, how I get nostalgic over these reels!) on this reel for simplicity. This reel provides decent casting accuracy and is also one of the easiest reels to untangle. For example, if you have any stubborn tangles in your line, all you have to do is open the bail of the reel and pull on the line. However, it is important to realize that like each reel, this reel does have a couple disadvantages that come with using it. One of the major disadvantages of the spincast reel is that you do not have much room for line capacity (they’re small). This means that sometimes you cannot cast as far as you would like. This reel is also somewhat limited when it comes to a heavy test line, which means that it will be more difficult, if not, impossible to fish for big game fish using this reel. Don’t expect to haul in tuna with this. It is meant for small fish. I had one of these as a kid, and it served me well, but as I got older and gained experience I quickly moved on to spinning and baitcasting reels. Baitcasting reels are favorites with millions of anglers for good reason. Let’s look at some of the advantages of using baitcasters. Well, for one there is no line twist (tangled lines, or bird’s nests, are another matter, however) during the release of a cast, which makes it a great reel in itself. With a baitcasting reel, you will also get more power for greater distance casting. They come in light and heavy versions, depending on what you are fishing. This type of reel will give you more control and accuracy in casting but requires a little more skill than spinners. A baitcasting reel is an outstanding reel for big game fishing because it can handle heavier pound test lines. The one possible negative of using the baitcasting reel is that it does take some time to get used to. Nothing that a little time and practice can’t resolve, though. I remember learning how to use this reel, and it took me a couple of days to master the accuracy part of the casting. After you get the feel for it, however, you will want to use this reel frequently due to its high casting accuracy. Again, just keep in mind there’s a slight curve in learning how to use a baitcaster. Round Baitcasting Reel: This reel will have a larger spool, which makes it ideal for holding more line. Ideal when you want to cast a line as far as you want. There are few things more satisfying in life than a long distance fishing cast. Also, few things in life are as disheartening as a cast that is cut short due to a shortage of line . Low-Profile Baitcasting Reel: This is an increasingly popular type of baitcasting reel because it is are ergonomic, lightweight and easy to handle (here’s a radically new design). 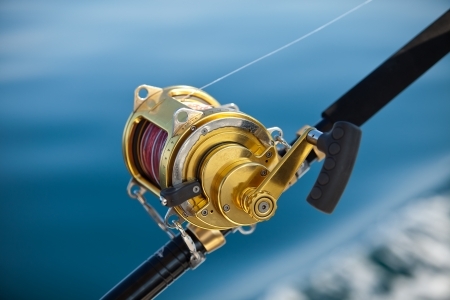 You can catch a wide variety of gamefish with the low-profile reel. As a bonus, it also greatly reduces line twist. Most of the I use reels today are spinning reels. The debate about baitcasters vs spinning reels, which one is better and so on, aside, I just love the how they feel… and the versatility they give me. It is the reel of choice for many anglers, whether they are fishing bass on the lake or targeting tarpon along the beach. The way you cast a spinning reel is you flip up the metal bail wire, which releases the line for a cast. Then you flip the metal wire down, and it locks the line in place. One thing that does bug me, though, is a trigger-happy bail on some of these reels… oh no, there goes that brand new lure! This type of reel spins as your line is being retrieved, which is how it got its name. The setup with the spinning reel is straightforward and easy, and It is also an easy reel to learn to use. The spinning reel is another good choice for beginners who want to skip over spincast reel because, again, it is easier to use. These reels can also be equally affordable depending on the type that you purchase. They also make a good choice for the seasoned angler looking for versatility, who may want to work light artificial lures or fish live baits. Both baitcasting and spinning reels can be used for surf fishing. It really comes down to the angler and which type he or she prefers. I prefer spinning surf reels, again, because I like the lightweight feel, versatility and higher retrieval rates they generally provide. The best Surf reels are designed to withstand the harsh conditions of the surf, among which saltwater, sun, and sand are but a few. Good surf fishing reels are made of either anodized aluminum, graphite, or both materials, and have sealed stainless steel ball bearings for maximum corrosion resistance. In addition to durability in the surf, they must also be able to hold a lot of fishing line and provide accurate and long casts. Surf reels should also be versatile as they are used for a broad range of fishing techniques and fish species. The surf fisherman will want a reel that can handle fishing different types artificial lures, as well as live and cut baits while chasing everything from speedy Spanish mackerel to big, powerful Striped bass in the surf. Offshore reels are made tough! They can be baitcasting or spinning reels. These durable, often more expensive reels, are designed to handle the harsh offshore conditions that would decimate other reels. They not only are they built to battle monster-sized fish, but they also must stand up well to the frequent saltwater splashes that come with the territory. Traditionally offshore reels were baitcasters; however, today we have many quality offshore spinning reels on the market. Because of the enhanced saltwater corrosion protection they offer, It is not uncommon to pay over $1,000 for a good offshore fishing reel. However, you can pay much less than that if you are a smart bargain hunter. The conventional or trolling reel (or casting reel as it’s often called), is generally used in deep sea or offshore fishing. Whether trolling or bottom fishing for big game fish in the deep blue or just a deep lake, conventional reels are useful. The important things to look for in a good trolling reel are heavy-duty graphite or machined aluminum construction, a smooth and powerful multi-disc drag system and large line capacity to handle prolonged combat with bigger and more powerful fish. They have to not only be able to handle more fishing line, but they also have to be able to pack on heavier test lines. Conventional reels come in either star or lever drag systems. Other features to look for in trolling/casting reels include a dual-speed reel, which lets you easily switch from fighting large, reel-smoking brutes like tuna and marlin to power-cranking up big fish from the bottom with the flick of a lever. A loud audible clicker will also come in handy so you can hear line being pulled over the engine noise. Fly fishing reels were designed with precision in mind. When fly fishing, you need to have accuracy in order to cast the line to your desired spot, so fly fishing reels offer some of the most accurate casting you can find. There is also a variety of different styles of reels for fly fishing. For example, you have certain reels that were designed specifically for trout fishing, and then you have other reels that were designed to catch salmon. With fly fishing reels, you also sometimes have large arbors on the reel, which increase the retrieval speed. Fly fishing reels are simple, reliable and durable, with emphasis on durability. It is not uncommon to see certain fly fishing reels that have been around for over 40 to 50 years still being used today. If you are looking to just make a one-time investment in a fishing reel, then a fly fishing reel will be one of the best you could make. The centerpin, or centrepin reel, which dates back to the early 19th century is a type of fishing reel that runs freely on its “center pin”, or its axle. The reel’s large diameter spool typically sits perpendicular to the fishing rod and allows for long distance casts. Two interesting features about these reels are that they are free-spooling and drag-free reels. This lets the line to pay out as the current pulls a “float”, or special bobber, downstream. Combined with a centerpin float rod, the reel allows for a presentation that appears more natural to the fish being targeted. More on the drag: instead of having a mechanical drag, the thumb of the angler is generally used for controlling the fish that is on the line. There are, however, some centerpins that do have a sort of a drag or resistance system. Centerpin reels are fantastic reels for big game fish like carp because it gives you a lot of control over them. The centerpin reel, an essential tool of the “float fishermen”, was at the height of its success during the 1960s in Great Britain. During that time, it was not at all uncommon to see people fishing with them. Today, the centerpin reel is still fairly common among Australian and European saltwater and freshwater anglers, and also remains popular with some anglers who fish the many rivers around the Great Lakes, both on the U.S. and Canadian side. Otherwise, this reel is not as widely used as many of the others and is a reel that is mainly used nowadays for coarse fishing. Well, there you have it. These are some of the reels that are commonly used for fishing and that have stood the test of time. You should choose a reel based on the type of fishing that you plan on doing. Nothing beats having the right tool for the job, and fishing is no different. Happy fishing!